The winners of the 2009 National Book Awards will be announced Wednesday, and the finalists in the category of young people’s literature include Deborah Heiligman’s captivating Charles and Emma: The Darwins’ Leap of Faith (Holt, 268 pp., $18.95). This dual biography is a portrait of the loving marriage of the author of The Origin of Species and his spirited and intelligent wife, who held religious views he did not share. An earlier post on Charles and Emma has links to more information about the book. The publisher recommends Charles and Emma for ages 13 and up — perhaps because of occasional mature content, such as the passing use of the word “erection” — but it may also appeal to younger children who are strong readers. 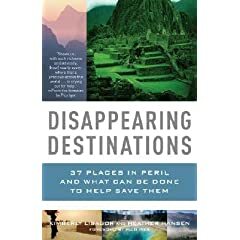 A book I haven’t read but ecotourists might want to look at: Disappearing Destinations: 37 Places in Peril and What Can Be Done to Help Save Them (Vintage, 400 pp., $15.95, paperback). Kimberly Lisagor and Heather Hansen won the American Society of Journalists and Authors 2009 Outstanding Book Award for general nonfiction for this collection of travel essays on spots that face an arsenal of threats, including logging (Lapland), mining (Appalachia), overdevelopment (the Galápagos), rising waters (the Maldives), and melting permafrost (the Alps). Pico Iyer writes in his foreword that “many of the marvels of our collective inheritance are disappearing, and because of human neglect or corruption or greed,” and Lisagor and Hansen sought out spots that, if unique, represent the dangers facing many other places. Alex & Me: How a Scientist and a Parrot Uncovered a Hidden World of Animal Intelligence — and Formed a Deep Bond in the Process. By Irene M. Pepperberg. Collins, 232 pp., $23.95. Copycat titles like Alex & Me usually appear on weak imitations of the books that inspired them – in this case, the bestselling Marley and Me, John Grogan’s memoir of his wayward dog. Not Irene Pepperberg’s true story of her 31 years with an African Grey parrot that, on the evidence of this book, was the Einstein of the bird world. Like Marley and Me, Alex & Me is an affectionate and entertaining portrait of a larger-than-life creature. But Pepperberg’s memoir is in some ways more interesting because it tells two stories at once. The first tale involves the life and death of an extraordinary parrot who followed his owner to colleges from Tucson to Boston, where she did research on his ability to learn. Alex could recognize numbers from one to six and and do simple addition. He could identify objects by color, shape and material. He seems to have grasped concepts such as “smaller” and “larger” and the idea of object permanence (that a thing still exists when hidden from view), which children generally acquire during the first year of life. The second story Pepperberg tells – nearly as interesting – involves her efforts, beginning in the 1970s, to be taken seriously by her peers despite two formidable obstacles. First, she was a woman when recruiters still asked female scientists questions such as, “What kind of birth control are you using?” And she was fighting the prevailing scholarly belief that animals were automatons who lacked cognitive abilities. Pepperberg parries inflammatory topics such as, “Did Alex have language?” and instead speaks of his ability to “label” objects. She also avoids some obvious questions – notably when she tells us that Alex would have an autopsy but not what it revealed about his walnut-sized brain. Best line: “Alex became quite a fixture at the vets’, talking to everyone who had time to stop and listen. His cage was right next to the accountant’s desk. The night before I was due to take him to Tucson, the accountant had to stay late, working on the books. ‘You want a nut?’ Alex asked her. Worst line: Pepperberg quotes a Guardian obituary: “Alex, the African Grey parrot who was smarter than the average U.S. president, has died at the relatively tender age of 31.” The evidence in Alex & Me doesn’t support the Guardian‘s claim, so it isn’t clear why it’s quoted. Alex could label numbers up to six. If the Guardian claim were true, the average U.S. president couldn’t tell you the address of the White House. Watch a video of Pepperberg interacting with Alex on the HarperCollins site. Furthermore: Pepperberg is an associate research professor at Brandeis and teaches animal cognition at Harvard. She also wrote The Alex Studies (Harvard, 2000). Janice Harayda is an award-winning critic who has been the book columnist for Glamour and the book editor of the Plain Dealer. One-Minute Book Reviews will announced the finalists for the Third Annual Delete Key Awards for the year’s worst writing in books on Feb. 26 and the winners on March 15, 2009. To nominate a passage in a book for a bad-writing award, leave a comment or send a message to the e-mail address on the “Contact” page. Angioplasties and stents are "good ideas that proved bad." Self-help books that urge you to micromanage every health risk have become disease unto themselves. So it was cheering to see the New York Times giving serious attention to a new book by a noted physician who still believes that less medicine can be more. “Reviewing the data behind many of the widely endorsed medical truths of our day, he concludes that most come up too short on benefit and too high on risk to justify widespread credence. “Dr. Hadler sees no evidence that mild high blood pressure or mildly elevated blood sugar pose much of a risk to longevity — certainly not enough to warrant the aggressive drug treatment often offered for them. The same goes for the extra 20 pounds that make you overweight but not obese, and the modest elevations in serum cholesterol that, these days, spell a statin drug for life for many healthy people. Zuger compared Worried Sick with a new guide by Nancy Snyderman, a surgeon and the chief medical editor of NBC News, who — as anyone who has watched her televised reports may know — is ever-ready to parrot the medical establishment’s prescriptive-flavor-of-the-week. And though Zuger doesn’t come down on the side of either approach, her review is lively, open-minded, and worth reading www.nytimes.com/2008/06/24/health/24book.html?ref=science. To read more about Hadler and Worried Sick, click here uncpress.unc.edu/browse/book_detail?title_id=1545. Hadler’s book and individual chapters from it are available in e-book or downloadable formats through the Caravan Project www.caravanbooks.org/. Why spend money to send astronauts into outer space when we could use it to fight poverty and hunger on Earth? Americans began asking the question long before July 20, 1969, when Neil Armstrong and Buzz Aldrin, Jr. walked on the moon as Michael Collins orbited with their spacecraft, and some may ask it again today. “I understand the arguments about how the billions of dollars spent to put men on the moon could have been used to fight poverty and hunger on earth. But, look, I’m a scientist who sees inspiration as the ultimate tool for doing good. I usually post these examples of backscratching without comment, but this one is bad on so many levels, I’d like explain why. A pillar of journalistic ethics says that reporters should avoid not just conflicts of interest but the appearance of conflicts. Gina Kolata is a science writer for the New York Times who has used Groopman, a professor at Harvard Medical School and a bestselling author, as a source. As the comments below make clear, she accepted a favor from Groopman — the blurb for Rethinking Thin — that could put money in her pocket if, say, you bought the book based on his recommendation or if a paperback or overseas publisher paid more for the reprint rights because of the quote (and quotes can affect the amount offered). Kolata has compounded the problem by selecting one of Groopman’s essays for Best American Science Writing 2007, a decision that has almost certainly put money in his pocket, given that contributors to anthologies typically receive an up-front fee or a percentage of the royalties or both. She also used on the cover of the paperback edition of her earlier Flu a quote from Groopman that appeared in the Boston Globe, which is owned by the New York Times. It gives me no pleasure to say any of this because I enjoy Kolata’s work for the Times and regard it as far superior to that of her colleague Jane Brody, who writes the Personal Health column. I also admired much about Flu, Rethinking Thin and Groopman’s How Doctors Think www.oneminutebookreivews.wordpress.com/2007/12/28/. Groopman in a review of Kolata’s Flu: The Story of the Great Influenza Pandemic (Touchtone, $15, paperback) in the Boston Globe, Dec. 12. 1999. “A masterly recounting of medical history” appears on the cover of the paperback edition of Flu. Gina Kolata on why she choose Groopman’s article as one of the best of the year, in her introduction to Best American Science Writing 2007 (HarperPerennial, $14.95, paperback), edited by Kolata and Jesse Cohen. One-Minute Book Reviews welcomes suggestions about authors should be in “Backscratching in Our Time,” a series in inspired by “Logrolling in Our Time” in the old Spy magazine. © 200X Janice Harayda. All rights reserved. Rethinking Thin: The New Science of Weight Loss — and the Myths and Realities of Dieting. By Gina Kolata. Farrar, Straus and Giroux, 257 pp., $24. You know how some people say they can eat anything and not get fat? And how others insist they gain weight if they so much look at a Caramel Pecan Brownie at Panera? Their claims may be less far-fetched than they sound. In Rethinking Thin Gina Kolata makes clear that dieters have been misled for decades by academic and other experts who promote strategies that haven’t been proved to help people achieve long-term weight loss. Among the oversold tactics: willpower, talk therapy and removing soda and snack machines from schools. If willpower doesn’t help most people stay thin, what does? Perhaps above all, having slim parents. No small value of this book lies in Kolata’s willingness to say two things diet experts rarely acknowledge: first, that people don’t get fat because of psychological problems and, second, that in the struggle to stay thin, genes matter. Rethinking Thin offers persuasive evidence that fat and thin people suffer equally from stress, anxiety and depression and that weight is to a large extent inherited. This doesn’t mean that trying to lose weight is a fool’s errand, but it does mean that some people will always have to work much harder than others to stay thin. And if you have trouble keeping a New Year’s resolution to lose weight, the fault may lie less with you than with all those Size XXL branches on your family true. Best line: “Free will, when it comes to eating, is an illusion.” Kolata is summarizing the views of Jeffrey Friedman, an obesity researcher at Rockefeller University, and his colleague, Bruce Schneider, and much of her book supports this view. Furthermore: Kolata is a science writer for the New York Times who lives in Princeton, NJ.